Toasted-Coconut Vanilla Milk Stout... On Nitro! I'm not a big fan of seasonal beers. Why isn't an Oktoberfest appropriate to drink in November (or October for that matter)? Sometimes I want a wit in February or a Double IPA in August! While there are a few "true" seasonals, like wet-hopped beers, most recipes can be brewed and enjoyed anytime of the year. What I’m more interested in is brewing and drinking beers that evoke a certain time and place. Each year for the last seven years that has included a dark/funky saison. While Alex and I brew them each fall, it isn’t a “seasonal” in the sense of dusting off last year’s recipe and re-brewing. We also aren’t slowly dialing in on a target. Our goal each year is to reimagine what fall tastes like. We’ve started with an original gravity as high as 1.078 and as low as 1.051. As dark as 29 SRM, and as light as 15 SRM. We’ve added raisins, dates, figs, currants, cranberries, wine grapes, citrus, honey, and numerous spices and herbs. For the 2014 iteration we decided on English and citrus. Going for toasty malts, including a base of Maris Otter, paired with bold citrus zest in the fermentor just before bottling. Toasty and funky isn't a common flavor combination. Brettanomyces produces tetrahydropyridine (THP), which at low levels provide a toasty flavor (at higher levels the perception of THP shifts to urine, or euphemistically "mousy."). I suspect this compound also plays a role in the "Cheerios" flavors bottle-conditioned sours often temporarily develop. As a result, many brewers avoid adding toasty malts to beers that will be fermented with Brett. However, I've actually had pretty good results with beers like my Courage Russian Imperial Stout clone (which included Maris Otter, amber, and brown malts) as well as a Brett-influenced version of Capitol City's ESB. An unauthorized collaboration, I won a 15 gallon keg of it and had to figure out something to do with the last few gallons. The fermentation of Dark Saison VII is being carried out by a diverse mix of microbes. The brewer's yeast is Omega Saisonstein's Monster. A hybrid strain resulting from the controlled mating of a Saison Dupont isolate and French Saison (the goal being the classic peppery phenolics of the first with high attenuation of the second). Brett isolates from Le Trou du Diable were provided by Richie (Mark of the Yeast). Lastly a little Lactobacillus brevis from White Labs. If you don't get random boxes of yeast in the mail a couple times a month, and as a result can't procure all of these strains, then choose a saison yeast and whatever microbes suit your tastes! 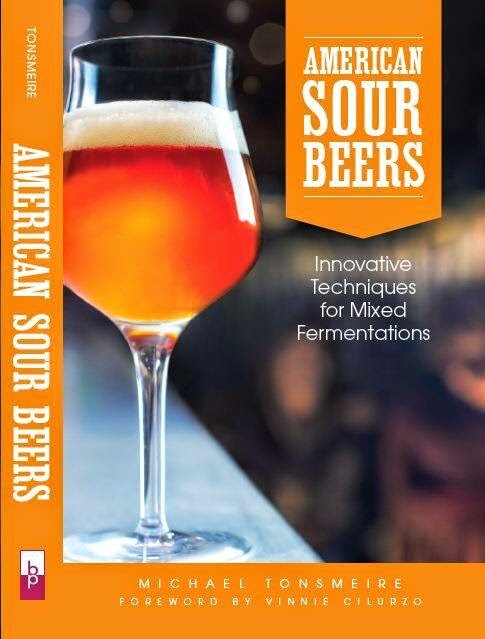 On a related side-note, I'm now the Advanced Brewing columnist for Brew Your Own magazine! You can read more about Saisonstein's Monster in my February/March article about blending yeasts. The April/May issue will have an article I wrote with Matt Humbard featuring an experiment comparing the pH drops at four temperatures by four commercial strains of Lactobacillus, including White Labs L. brevis. Subscribe to BYO via this link to support the blog! 0.50 oz. Palisade (Whole, 8.00% AA) @ 60 min. 12/11/14 2.5 L stir-plate starter with Saisonstein's Monster and Canadian Brett (Le Trou du Diable isolates). 12/14/14 Brewed with Alex. Mash pH 5.36. No adjustments. Cold sparged with 3 gallons of water. Collected 13 gallons of 1.060 runnings. Boosted my efficiency more than expected. Chilled to 72F with plate chiller, pitched half starter with the addition of White Labs L. brevis (directly) into mine. Shook to aerate. Left at 67 F to ferment. 1/29/15 Racked to secondary, moved to cool basement. 11/13/15 Added the zest from 1 etrog, 40 g to be precise. 11/15/15 Bottled 5 gallons with 4.5 oz of table sugar. 5/3/15 Tasting notes, happy with how it turned out, but would dial back the Maris Otter for a re-brew. Awesome stuff! I haven't tried the Quebec blend in a copitch, only primary and secondary. I'm excited for the results! Let me know if you want more yeast to try out. How did you prepare the zest, and how much was used? I haven't added the zest yet. I find the citrus flavor fades, so I'll add it for just a couple days right before bottling. My process is to wash the skin and then peel it as carefully as I can with a vegetable peeler. I'll turn it over and scrape off any of the white pith where I wasn't careful enough. I find this produces a more assertive flavor than using a MicroPlane zester.